1 How to win SoundWear Companion Speakers from Amazon Bose Speaker Quiz Time? 2.1 Q1) Which of these is NOT a feature of the new SoundWear Companion speaker? 2.3 Q2) Charging the SoundWear Companion for 15 minutes can give you up to ___. Fill in the blanks. 2.5 Q3) Which of these is the technology used in the SoundWear Companion speakers? 2.7 Q4) With the SoundWear Companion Speakers, you can walk while taking a call, multitask and voice control your music. 2.9 Q5) Which of these is NOT a color that SoundWear Companion covers come in? 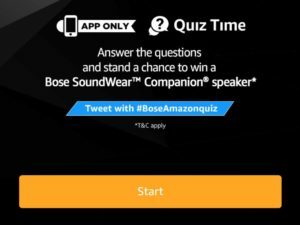 Amazon is back with a new Quiz, and we added all the answers of Amazon Bose Quiz. 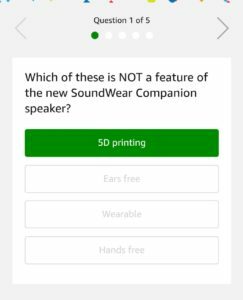 In this quiz, 4 winners will get Bose SoundWear Companion Speakers just by answers 5 simple questions. Bose Corporation is a privately held American corporation, based in Framingham, Massachusetts, that designs, develops and sells audio equipment. Founded in 1964 by Amar Bose, the company sells its products throughout the world. According to the company annual report in the 2017 financial year, Bose received revenue of US$3.8 billion and employed more than 8,000 people. Bose is best known for its home audio systems and speakers, noise cancelling headphones, professional audio systems and automobile sound systems. So, just check this post to get detailed information on Amazon Bose Speaker Quiz Time Answers. Just answer 5 simple questions to get a chance to win SoundWear Companion Speakers. This quiz will remain live until 25th May 2018. You have to go to the bottom of the Amazon App Home page to enter this quiz. We also added Amazon Quiz Winners List, you can check that from the below mentioned link. 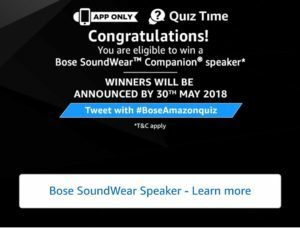 How to win SoundWear Companion Speakers from Amazon Bose Speaker Quiz Time? 2. 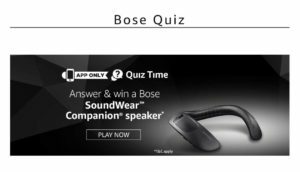 Open the app and you will see a banner about the Bose Speaker Quiz Time contest. Click on it. 3. Now click on the ‘Start’ button to begin the Amazon Bose SoundWear Speaker quiz. Q1) Which of these is NOT a feature of the new SoundWear Companion speaker? Q2) Charging the SoundWear Companion for 15 minutes can give you up to ___. Fill in the blanks. Q3) Which of these is the technology used in the SoundWear Companion speakers? Q4) With the SoundWear Companion Speakers, you can walk while taking a call, multitask and voice control your music. Q5) Which of these is NOT a color that SoundWear Companion covers come in? 5. After answering all 5 questions correctly. That’s it. Just wait for the Winners list of Soundwear Speakers Quiz. 1. This Contest will commence on 25th April 2018 from 12:00:01 a.m. (IST) to 25th May 11:59:00 p.m.
6. The declared winner(s) will be eligible for winning a Bose SoundWear Companion speaker (hereinafter referred to as “Prize(s)”).